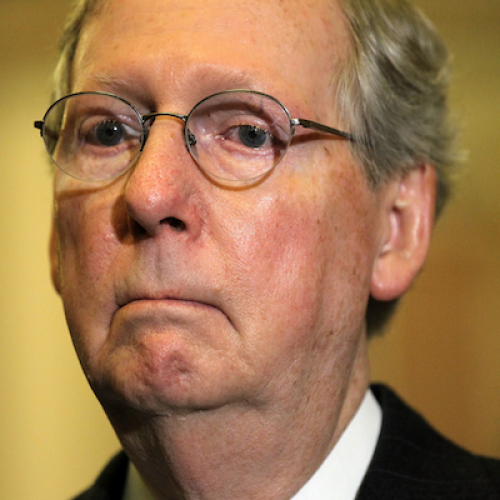 Mitch McConnell appeared on three major networks Sunday morning. But the Senate Minority Leader had just one message to deliver: We’re done with tax increases. Americans have heard this argument before. But they might be more inclined to believe it now, for precisely the reason that McConnell cites: Last week’s legislation raises taxes. Isn’t that enough? Isn’t it time to go back to spending cuts? Hardly. For one thing, last week’s agreement, known as the “Taxpayer Relief Act,” was not the only deficit reduction legislation that Obama and the Republicans have enacted. Rather, it’s the latest in a series of measures. Most notable among the past efforts was the 2011 “Budget Control Act,” which Obama signed after Republicans first threatened to hold up the debt ceiling increase. Those past measures, which were all spending cuts and no tax increases, reduced the deficit by $1.5 trillion. The Taxpayer Relief Act, which is all tax increases and (almost) no spending cuts, reduces the deficit by less than half that amount. So even taking into account last week’s agreement, deficit reduction has meant more spending cuts than tax increases. And it will continue to be so. During that same “Meet the Press” interview, McConnell said Obama “doesn’t embrace the effort to reduce spending.” That's just not true. The original proposal he made to House Speaker John Boehner, shortly after the election, included hundreds of billions of dollars in proposed spending reductions, including cuts to discretionary spending (which is already at historic lows) and to Medicare. The Medicare cuts were all on the provider side—that is, they would have reduced what the program pays hospitals, drug makers, and other suppliers of care, but without directly reducing benefits. But in a subsequent proposal, one Boehner ultimately rejected, Obama said he would even agree to a reduction in Social Security benefits. In this next round of fiscal policy making, Obama has said he wants more revenue; most likely, he will return to some of the ideas that didn't make it into last week's deal. But Obama hasn't said he wants an all-taxes approach. On the contrary, he has also said he wants more spending cuts, too. If this Republican view holds, then when all of the deficit reduction efforts are tallied together, spending cuts will outpace revenue increases by nearly 5 to 1. ... If future deficit reduction comes through an even split of revenues and spending cuts, total spending cuts will still outpace revenue increases by nearly 2 to 1. Of course, McConnell and his allies have no problem with five dollars of spending cuts for every dollar of new taxes. Remember: During the presidential primary campaign, all of the Republican candidates said they’d reject deals with even ten dollars of spending cuts for every dollar of new taxes. As far as they are concerned, one dollar of new taxes is one dollar too many. the last time we actually balanced the budget—from 1998 to 2001—revenue surpassed 19.5 percent every year, averaged 20 percent of GDP those four years, and topped out at 20.6 percent of GDP in 2001. And that was before the Baby Boom generation began to retire. This may not be what most Americans want to hear. But most sensible budget observers, even more conservative ones determined to enact substantial budget cuts, believe taxes must rise even more—because the population is getting older and the government has, quite rightly, assumed so much responsibility for health and retirement benefits. The chairmen of the president’s deficit reduction commission, Erskine Bowles and Alan Simpson, suggested taxes should eventually reach 21 percent of gross domestic percent. (Sadly, and predictably, Bowles and Simpson neglected to criticize McConnell about this when they followed him on "Meet the Press.") Pete Domenici and Alice Rivlin, authors of a widely respected (but under-appreciated) proposal from the Bipartisan Policy Center, think taxes should go higher than that. Keep in mind that, by international standards, Americans pay very little in taxes. Republicans and their allies take a different view, because, if they had their way, the government would provide a lot less than what it does now. But it’s not a popular view and they know it. That’s why, on “Meet the Press,” McConnell declined to get specific about exactly how he’d reduce spending. He didn’t say that the discretionary spending cuts he’s embraced would mean fewer food inspectors, longer delays at airports, or less housing assistance for poor people. And he didn’t reveal that the entitlement changes he’s endorsed would mean less financial protection for people on Medicare and Medicaid. Nobody likes paying taxes, but everybody likes the services that taxes finance. The Republican strategy is to make people focus on the former and ignore the latter.